Owning is a concept where you must realize where you are currently before you start on a journey to where you are going. Lust is real and most of us have participated in lust at some point in our lives. Lust has given us the choice to consume a woman’s beauty and body like a fast food meal. We have disregarded her personhood momentarily and lusted after her body. For many of us, we have lusted so often that we think it is normal to reduce a woman to her dimensions. We lust! If you think about Alcoholics Anonymous and the individual standing to face the room, we will hear him say, “Hi, my name is Bob and I am an alcoholic.” Bob owns and accepts where he is and this allows him to move toward healing. You have to own that you lust. Some of you lust constantly creating an illusion that women are images and not people. Until you can fully own your lust, it will be very unlikely that you can live your life lust-free. When Jesus healed people, they often came and proclaimed their condition. 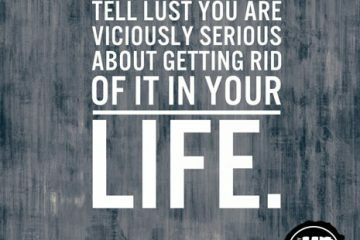 You must own your lust before you can start the amazing journey of living lust-free. On this date: ________________________, I admit to myself and God that I lust after women. How often do you find yourself lusting on a daily or weekly basis? How do you think you will feel being lust-free for weeks, months or years?